Crave a boost of energy but not a cup of coffee? 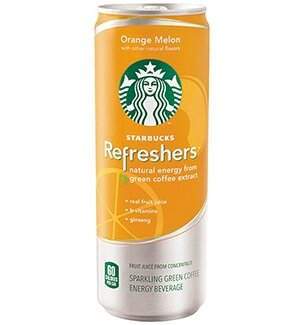 Orange Melon Starbucks Refreshers™ beverage will revitalize your senses with a fruit juice enhanced with the energizing properties found in coffee, but without the coffee flavor. Starbucks Refreshers™ beverages blend Green Coffee Extract with the flavors of real fruit juice for a sparkling and delicous pick-me-up you can feel good about. Spanish explorer Juan Ponce de Leon brought orange seeds to Florida in 1513 – today, the state is the second largest producer of oranges in the world after Brazil.